It's always a challenge knowing if you're raising your kid right. When do you step in and admonish that eye roll? At what point should your child be force fed something other than mac and cheese? How many scary stories should your little angel be allowed to read during the Halloween season? Well, you can sometimes feel bamboozled by all of these questions you can always remain proud that you'll always be a better parent than Sally's maker! If you're not getting served a dollop of sleeping potion every time your child wants to leave the house like Dr. Finkelstein. Talk about a controlling parent. He was like Cinderella's step mother made worse with a bad case of helicopter parenting. We get it, he stitched her together but as we all know, just because you made the child doesn't mean you can control that kid. Other than her habit of poisoning her guardian on the regular, Sally is a very sweet girl! She wants to save Halloween Town from her crush's schemes, she wants freedom, and like so many girls, she wants to be noticed for who she is. We can all feel for her! 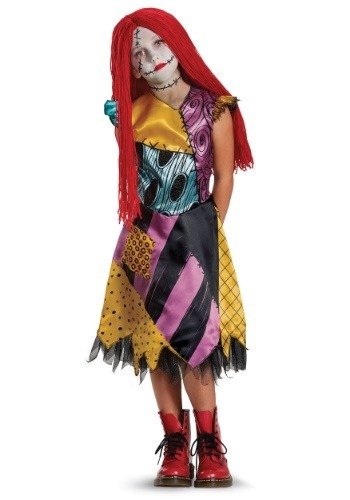 This Sally costume has seen an upgrade from Sally's movie rags. The dress is made of satiny fabric but retains the same Tim Burton flair with the unique patterns on the different patches. The neckline is asymmetrical, the sleeves slightly ruffled, and the hemline is cut in a ragged pattern and dressed up with sparkly tulle. Once she slips the costume on there will be no doubt in her mind, this is Halloween! My 6 year old looks so cute! Very well made! Come Halloween time when she is all made up I will do my best to remember to upload a picture.